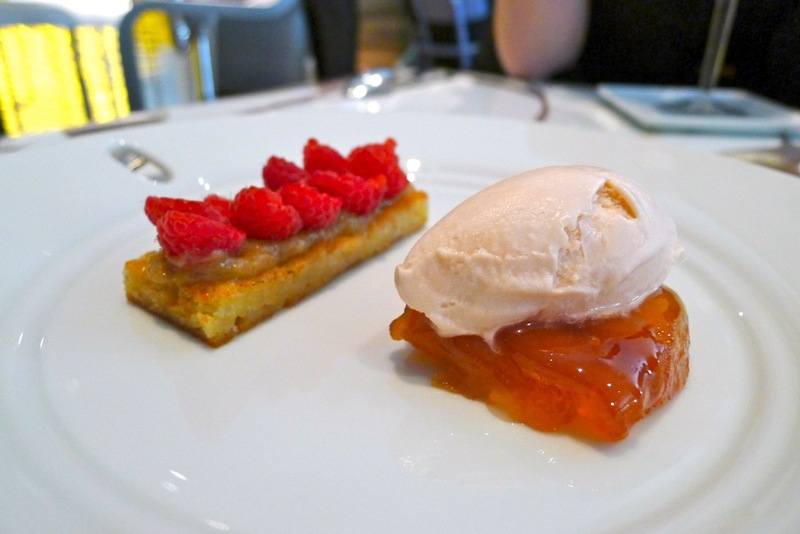 The story for this blog post starts almost a year ago, back in May 2011 when we discovered Pierre Gagnaire’s Sketch in London and ended up eating there three times in one day! 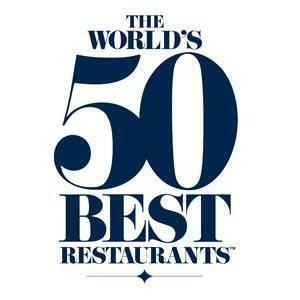 (see here) – we also vowed to travel to Paris to dine in his 3-Michelin-starred eponymous flagship restaurant. Then, last Christmas, my wife informed me that Santa had fixed it for me to go sometime in 2012. When better than April in Paris? So on Tuesday 2nd April, waking up early in our hotel as giddy as a goat with the upcoming evening meal at Gagnaire on my mind, I felt as if it really was Christmas all over again. Leaving my wife to a well earned lie-in on the first day of our holiday, I left for a stroll around the Montparnasse area with a vague intention of heading up though the Jardin du Luxembourg to check out what time Pierre Hermé would be open and to scout possible places for our first Parisian lunch (the rub being that most reputable restaurants remain shut on Sundays and Mondays). Although my wife insists we should just take a chance on ‘a random restaurant’, fussy fellow that I am I will rarely risk somewhere that I haven't researched or at least had a recommendation for from some sort of credible source. With that in mind, I reached for my trusty Michelin app. Fantastic! 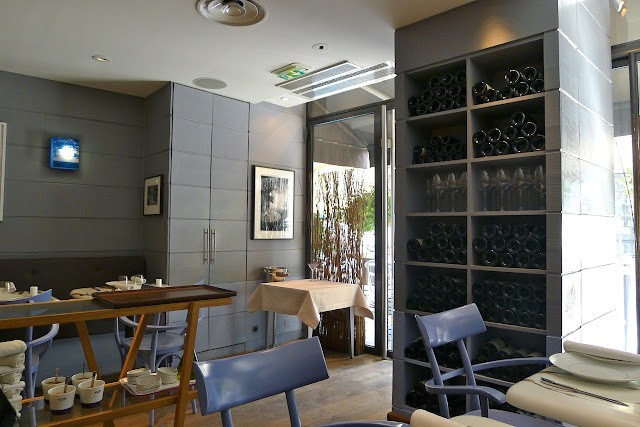 Hélène Darroze came up as being 0.22 miles from our hotel = closed Mondays. Guy Martin's Sensing also came up close = also closed Mondays. 35° Ouest? 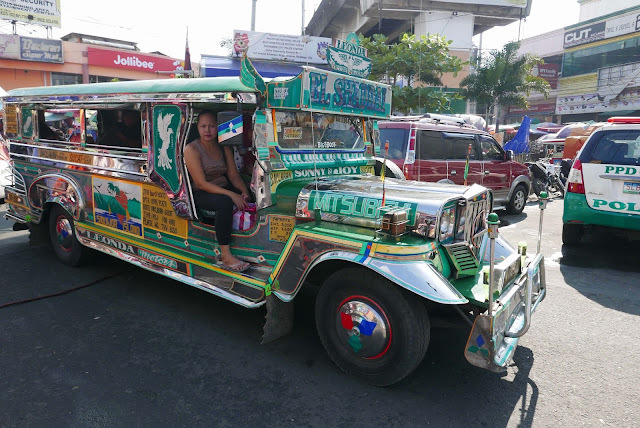 Aida? Sola? = Closed. Closed. Closed. 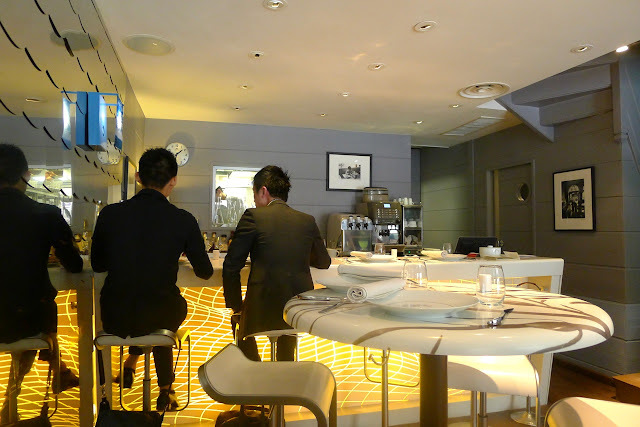 Then I struck lucky - a Michelin starred restaurant within walking distance of the hotel that was open on a Monday. 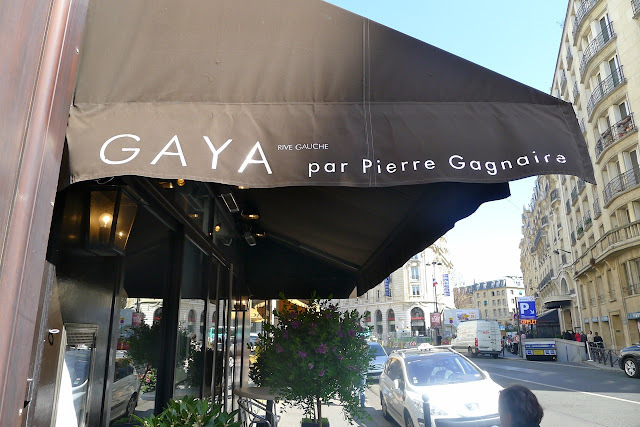 Not just any Michelin starred restaurant but Gaya Rive Gauche par Pierre Gagnaire. 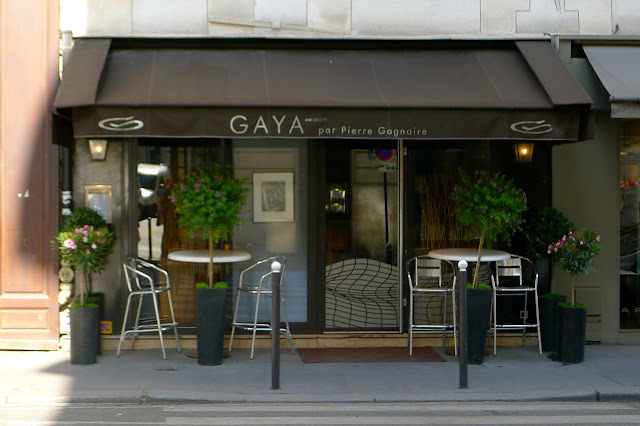 Gaya, on Rue du Bac opposite L'Atelier de Joël Robuchon in the 7th arrondissement, specialises in seafood. 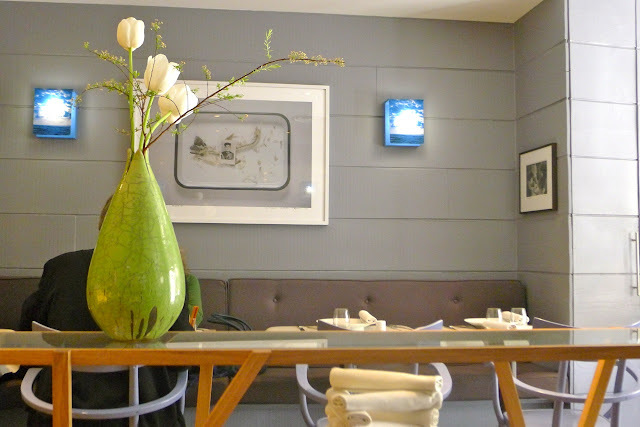 Described by Michelin as an ‘attractive and relaxed contemporary bistro’ the grey-blue decor created by Christian Ghion, gives the place a modern seafaring feel. We found the service to be formal (in terms of presentation), yet relaxed (in terms of setting and an absence of pomp). A set lunch for €60 was offered, although we opted for à la carte. 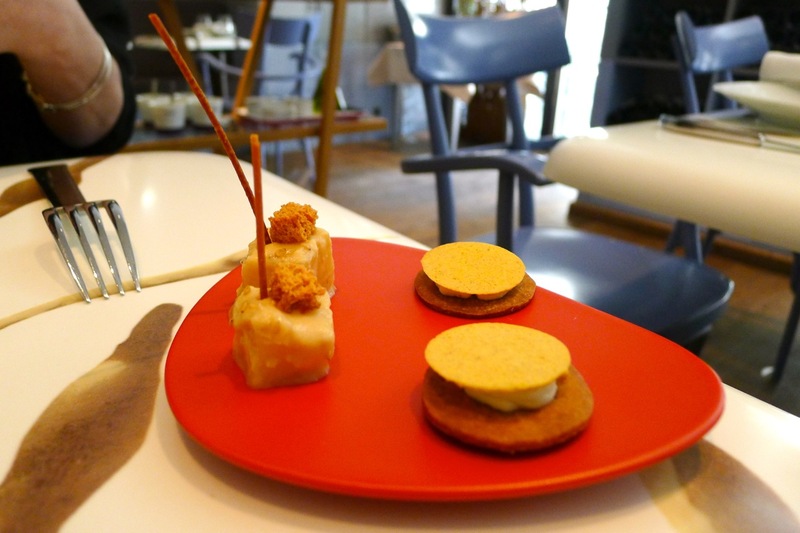 Gagnaire’s amuse bouche are always visually impressive and creative – these featured a delicately flavoured soft gooey bite of ‘celery’ and a perfect sablé topped with a Colombo spiced cream and signature disc Colombo meringue that we had previously enjoyed at Sketch. 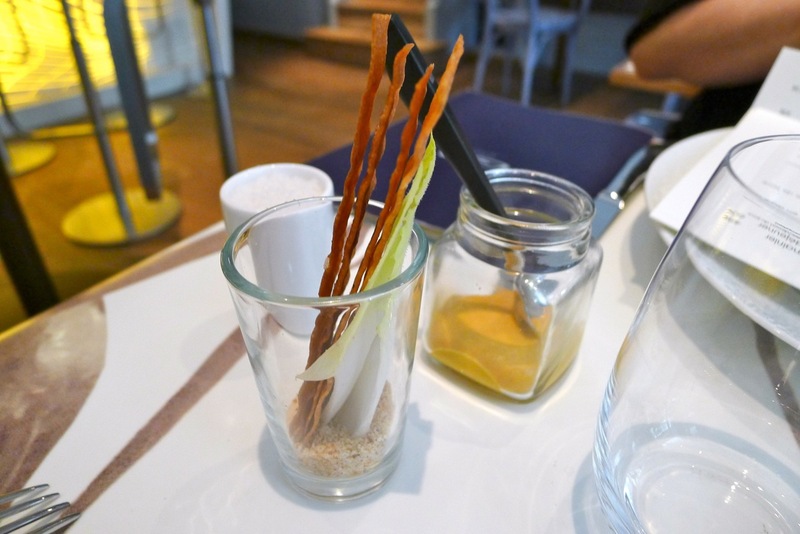 Completing the ‘amuse’ was a smooth white carrot cream with wafer thin bread sticks. 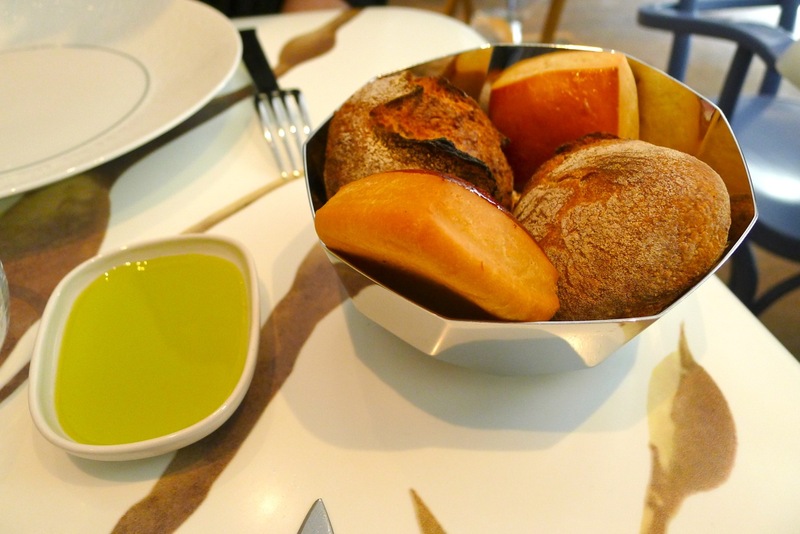 Throughout the meal we were also kept topped up with a free flow of sourdough rolls and brioche with oil. 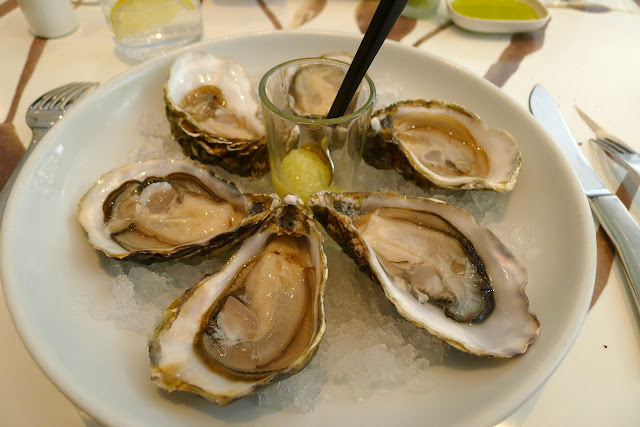 To start I selected the Huîtres de Printemps David Hervé servies sur glace; gel de citron au gingembre – the lemon and ginger gel being one of the tastiest oyster accompaniments I have ever had. 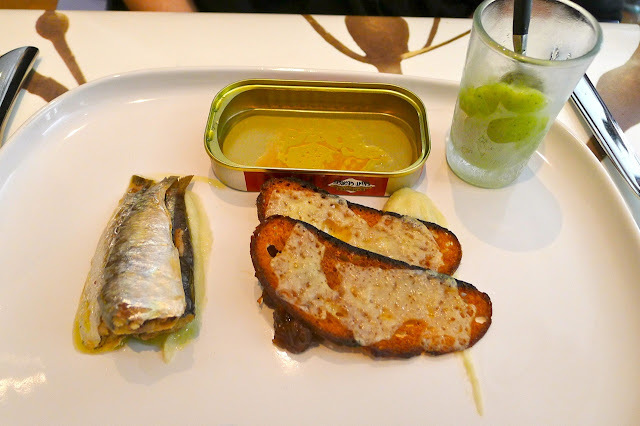 My wife went for Boîte de sardine La Belle-iloise. Fenouil au citron vert, granité citron/vodka/aneth. Toast au cheddar fermier, chutney – it’s a bit poncey to talk about how the lemon, vodka, fennel and dill ‘granité’ beautifully cut through the oiliness of the fish; but it did. With all the wonderful French cheeses available it was interesting to see farmhouse cheddar on the menu. 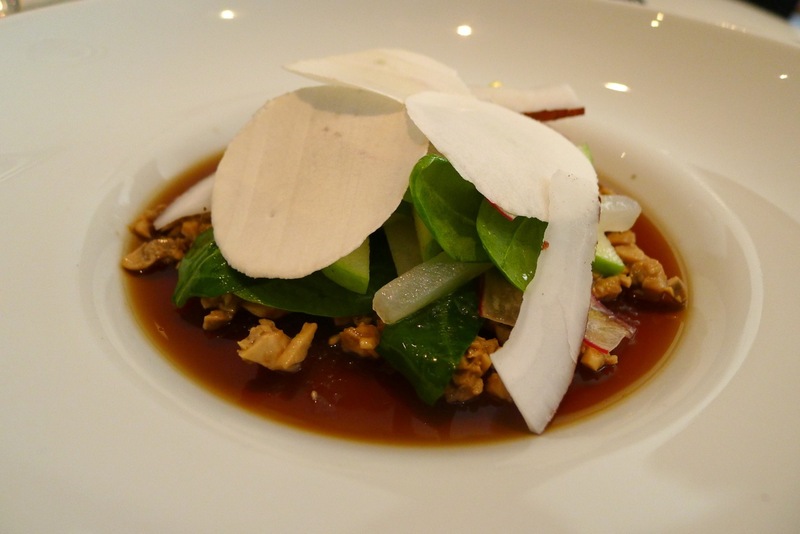 For my next course, I chose Duxelle et infusion glacée de champignon de Paris: noix de coco fraiche, pomme verte, radis, navets daikon et pousses d’épinard – texture often plays an important role is Gagnaire’s cuisine; in this dish the fresh zingy crunch of apple and the radishes, along with the tropical tinge of coconut contrasted beautifully with the exceptional duxelle. What tickled me with this dish as it was presented were the white discs that sat on top; expecting some kind of clever Gagnaire inspired molecular wizardry it seemed almost a double bluff when I realised they were simply paper thin sliced of white mushroom. Avocados are one of my wife’s favourite foods, as a result the intriguingly titled Quartiers d’avocat croustillants, condiment Dundee Pinky jumped out from the menu at her – whilst, I’m not a huge fan of the fruit, the crispy ‘tempura’ slices of avocado were absolutely delicious with the spicy ‘Dundee Pink’ (apparently named by Gagnaire in tribute to the conceptual artist Martin Creed who has recently revamped the chef’s Sketch restaurant in London). 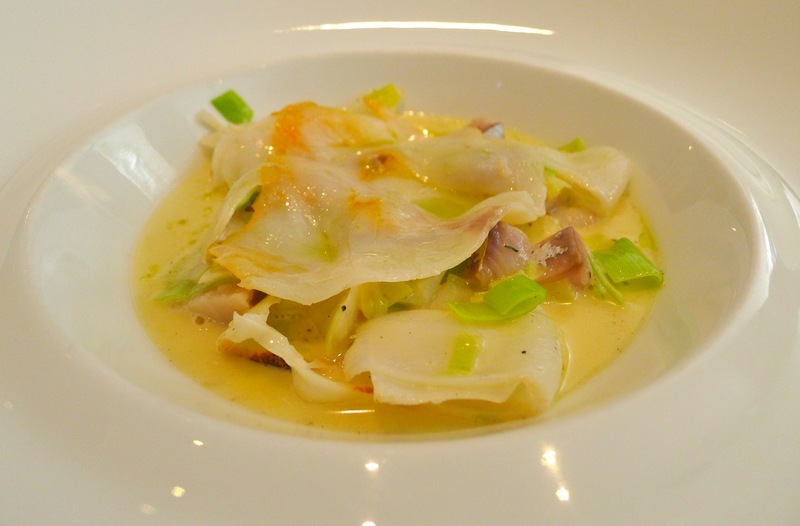 My final savoury choice was Corolle de haddock: gras de seiche, maquereau au sel et blanc de poireaux; beurre doux à la coriandre – not the most visually striking of Gagnaire’s dishes but a stunning plate of food, perfect executed with exceptional flavour. 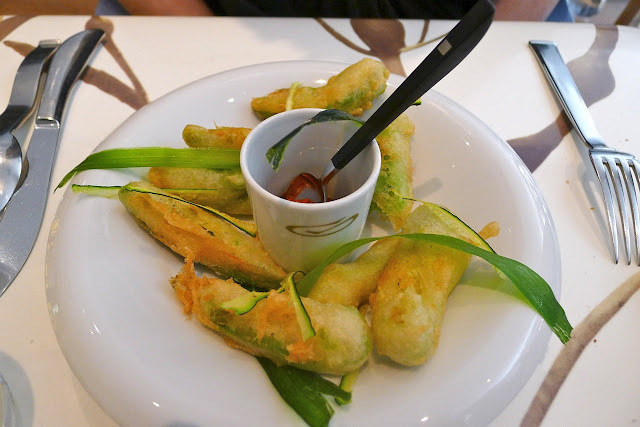 The sauce was wonderfully silky and buttery with firm bites of fabulously fresh fish – simply divine. 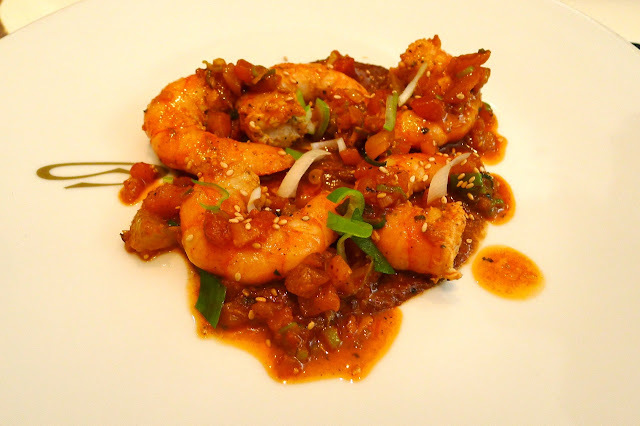 My wife also selected a fish main, Gambas du Mozambique cloutées de poivre vert puis saisies à l’huile de colza; pâte de sesame aux abricots secs – a vibrant and tasty dish with exceptional plump juicy prawns in a fruity, tangy sauce. To finish, I had Quarties de pomme rubinette cuits comme une tatin, frangipane de rhubarb – a simple dessert with classic flavour combinations. 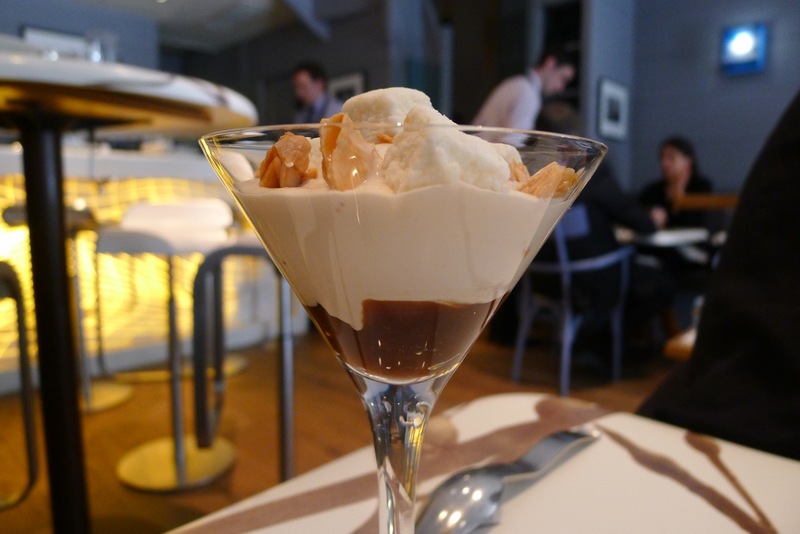 Served in a martini glass, my wife finished with Pannacotta café / Bailey’s / Kalua, pulpe de poire et amandes Polignac – a fitting end to a great meal. 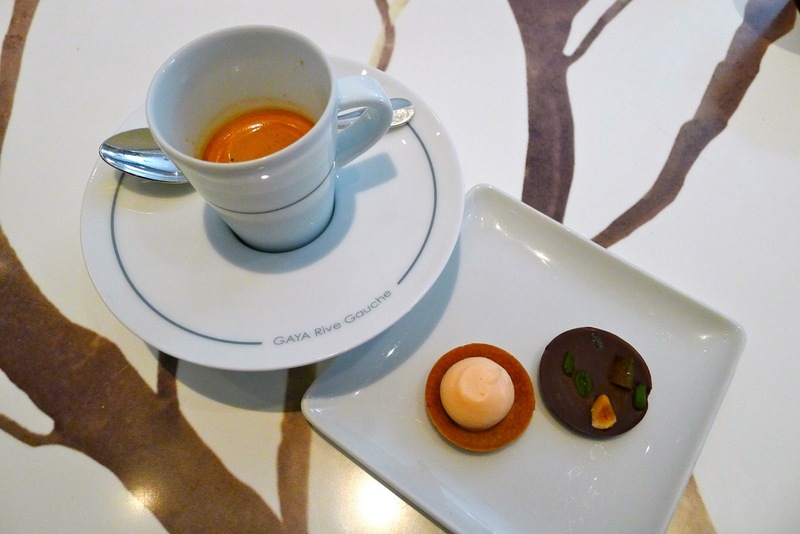 To round of the meal, an espresso served in bespoke Gaya crockery and petit fours featuring a pistachio nut chocolate and a fun ‘bubble-gum’ flavoured ice-cream.